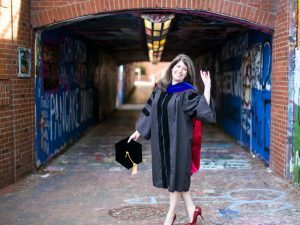 Research Activities: College of Education Dissertation Support Award, Graduate Student Association Conference Travel Award (to present research at the SITE Conference in March), and the NC State Graduate Student Symposium. Why I Chose the College of Education: I work closely with the college through my job in the College of Humanities and Social Sciences. When I began thinking about a Ph.D., I met with Kevin Oliver [professor of digital learning and teaching], who encouraged me to apply. Since I was working at NC State, it was a natural fit to stay here. What the College of Education Taught Me: First and foremost, that I can do anything I set my mind to. I was so intimidated during the first doctoral level course and throughout the process; I’ve had days where I doubted my abilities. The support I had from peers, professors and my advisor helped me see that I was capable of attaining this degree. Also, I’d say that I learned how to be a grad student from Dr. Meghan Manfra’s class, how to be a thinker from Dr. Beth Sondel’s class, and how to be a survey snob from Dr. Paul Umbach. Why I Chose My Field of Study: After meeting with Dr. Oliver, I felt that the program would best allow me to merge my language, teaching and technology interests. I really wanted to become a better online instructor, as well as a user and curator of digital learning and teaching tools. How the College of Education Changed Me: It challenged me to think beyond my personal and professional lenses, it pushed me to ask questions, and it helped me become a researcher. I also saw lots of support from the college for Ph.D. students, which is refreshing as one hears lots of horror stories about the graduate experience.